Rather than people all around you, rapid-fire transit, and recurrent noise 24/7 -- such is life in Downtown Chicago --, it's open space everywhere you look, wildlife and nature at every corner, and near silence. I was only there for a tad more than 48 hours, but my trip to the Rocky Mountains this weekend was one I won't soon forget. Best part -- we stayed in a lodge in a valley surrounded entirely by mountains -- 360 degrees. You'd wake up in the morning to a fresh, forrest-like smell, and every direction you look would be like a postcard. It was God's creation all around you, hardly any sign of man-made constructions, and the whole trip was filled with inspirational and dramatic sights. Pictures just don't do it justice, in my opinion. You have to be there to experience it, and experience all the outdoors have to offer. And there's so much. I could have spent weeks there if I had the chance. And I'd love to go back. But here's a few pictures anyway. One of a few mountains near our lodge, one of my sister and I in the Rockies, and one of buffalo we saw on the side of the road in Wyoming. So why was I there? 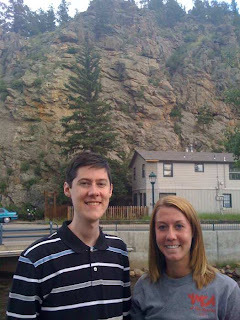 My sister is working at the YMCA in the Rockies (Estes Park) this summer, so I went out to visit her. My parents made the trip too. It was my first time ever in Denver, though I didn't get to see the city other than from a distance landing at the airport. Spent most of the time in the Rockies and also made it up to Cheyenne, Wyoming, for a rodeo and Frontier Days on Saturday. Though short, the trip was action-packed: plenty of exploring; lots of exercise, basketball, swimming, and more; learning about trees, birds, history; the rodeo, which was really interesting; and coming across countless streams, mountains, lakes, etc. Definitely memorable, and again, I'd love to go back there someday. 2 comments on "Rocky Mountains well worth the trip"
The Rockies truly are breathtaking. I remember driving up in our bus the first time I went skiing over 13 years ago. You don't believe anything could be that big (ie the mountains) and so vast. Now you just have to go skiing there Craig! so glad you could make it to the rockies... love you craig! miss you!